In this post-modern era the organized ‘Faith Based Organizations’ (FBOs) and Society are experiencing lots of challenges to retain their dogmas and traditions due to the changing value systems and by the influence of modern life related orientations. India is not even exempted from these challenges. India is an ‘icon’ of unity in diversity. It is a cradle of most of the major faiths in the world including several folk traditions including the ideologies like Dravidian-ism. For centuries we have examples of Indian spirituality such as cohesive living, where all live in harmony as faith communities along with all creation. Indian spirituality upholds the essence of inclusivity and affirms that God is creator; every atom in creation is God’s handiwork, including human communities. There is diversity in God’s creation but certainly not any discriminatory elements in them. Therefore, recognizing the value of human life and love, and also respecting the relationship, marriage is a bridge to unite humans with all their diversities to live as an inclusive communities. The traditional, social, cultural systems of societies generally dissuade persons to move out far from their native places. In some cases, moving away from one’s native region and settling elsewhere is considered to be an insult to the society of one’s native region. But today, the processes of globalization and liberalization, and the economic and development polices of the States are forcing such migrations. Youngsters move out of their societies to metro cities where they find their employment hubs. Such movements expose them to different cultures, languages, food and heritages and other societal systems. Such a situation brings together men and women of various differences, backgrounds, ethics, faiths, traditions, practices and orientations for studies and employment. This facilitates relationships of mutual understanding, appreciation and love which leads them to inter-faith marriages. For example, when a ‘modern woman’ marries a ‘patriarchal’ man, the understanding of gender-roles, through faith expressions, broadens to create a new flavor of coexistence. While intra-faith marriages continue to be conducted in holy places of the respective religious traditions, the data obtained from the Government Departments of Stamps and Registrations shows a 306% increase in marriage registrations from 2013-14 to 2014-15 at the Registrars’ Offices all over India. Media analysis states that this increase is due the non-accommodative attitudes of the Faith Communities and Faith Organizations to inter-faith marriages; therefore these couples who belong to different faiths resort to getting married at the Offices of Registrars. Of course, we cannot ignore the role of ‘rationalism’ and ‘Dravidian-ism’ in facilitating ‘self-respect marriages’ in southern parts of India, especially in Tamilnadu, by which the couple could adopt a secular way of getting married by giving-up religio-cultural-ritual marriage patterns. The bottom line for such self-respect marriages is to renounce the oppressive caste system and religious practices. Theologically, such, interfaith marriages facilitate a generation to have a broader understanding of God and Spirituality. A new dialogue (either silent or vocal) is initiated and practiced by these couples. In fact a new ‘Spirituality’ is articulated through Interfaith marriages, as the married partners accept each other as he or she is, and even visit each other’s holy shrines either individually or together. In most cases the personal understanding and spiritual bond between two individuals, help them to think beyond exclusivist theologies and prejudices of the faith traditions to which they belong. However, in some cases the exclusivist theologies and prejudices may lead to a break-down in their inter-faith marriage relationship. In most faith traditions, inter-faith marriages are considered to be anti-scriptural and even condemned to be sinful. Unfortunately, traditional theologies / faiths do not allow interfaith couples to lobby for their space in the families and societies. The requests of individuals to the faith leaders and clerics to get their inter-faith marriage solemnized in the holy shrines are turned down, because the clerics find it difficult to break the rules and regulations and the official theological stand of their faith institutions. In fact some of the couples come to clerics with their simple faith, thinking that God would bless their love relationship. In a few cases, the clerics perform a “post-civil marriage blessing” when it is allowed by their rules and traditions. Furthermore, clerics face the issue of pastoral / clerical care and support for inter-faith marriage couples and their children. However, when individuals from different faiths / castes come together in marriage, they are often mocked, penalized by family members, ex-communicated, stigmatized and may even become victims of ‘domestic violence’ ‘honor-killing’, ‘discrimination’, ‘stigmatized’ as anti-societal and cultural and so on. Though, legally the Family laws in India do not hinder inter-faith marriages, family norms mostly the popular societal and cultural norms continue to outrageously ‘discourage’ and ‘omit’ otherwise. Therefore, inter-faith couples are not only let down by their respective families but are also disowned by their respective faith-communities, relative and communities. In order to avoid problems, inter-faith marriage couples live far away from their families and communities though with fear of being found-out, discriminated and stigmatized. Especially, the role of Khap Panchayats (Local legal system, where the village elders sit and pronounce judgments) plays a vital role in pronouncing harsh judgments against these interfaith and inter-caste couples sometimes against their families by excommunicating them from the very life of their societies and go to the extent of banning not only relationships with them but also supplying water (from public wells) and food grains. In some cases, the parents of the couple go to the extant of involving in domestic violence against the bride and even killing either both or one to uphold their caste or faith prides. In such instances, the apprehension begins with the fear of the imbalances that inter-faith marriages are assumed to create. Secondly, the situation of women is found to be much worse in such marital contexts. Most of the Indian cultures affirm, and promote, that married women are expected to stay with their respective husbands; they have to leave their homes and parents. In many cases the dowry system plays a major role of facilitating acceptance of the bride at the in-law’s place. The bride is expected to be submissive and should not voice out any of her opinions and feeling. In most cultures, marriage is for pro-creation and women are expected to give birth to the legal heirs for her husband’s family. For this reason, they have been abused and harassed to the extent of divorce or separation in case if they are unable to give birth to children even if the husbands are impotent. Though the women in mixed marriages go through a higher backlash when compared to men, the children of these interfaith couples are found to be most vulnerable as they live in trauma and confusion till they grow to understand the complexities, challenges, and values of inter-faith relationships. Hence, the National Council of Churches in India – Unity and Mission joined the Church of Sweden and initiated a study process on Inter-faith Marriages to help its member Churches to have a comprehensive knowledge about ‘marriage’ and ‘families’ in the modern day contexts and realities including a Gender Justice, Legal and Cultural Perspectives. This might enhance the societal world view of the Church and other faiths along with other peoples’ movements in India to prepare diligently for the future, for such occurrences. On 30th June 2018, Church leaders from the Tamilnadu region were invited by the Tamilnadu Christian Council (Regional Council of NCCI) to share the highlights and the outcome of the Round table held in Madurai. The leaders were informed that: every scripture affirms God’s creation as the inclusive household of God where all are seen and related as equals. In theological terms, “plurality is a gift of God and it’s a blessing”. And all faiths affirm and promote the institution of family as gift of God. Likewise, in every theology (faith), marriage is seen as a theological declaration that ‘lawfully unites’ a male and a female in the name of God / in the presence of God for procreation and binds a covenant between God and the couple and between the marriage partners themselves. The By-laws and Constitutions of different faith confessions theologically justify, accept and administer same-faith (intra-faith) marriages at their own holy shrines. Such marriages are legal, acceptable and recognized by the societies at large. Every popular / organized faith tradition thus facilitates the solemnization of intra-faith marriages and the adherents are oriented to remain committed to their faith practices and culture. It is such situations that calls Church and other faith leaders to look at the issue legally (ecclesial and social), theologically and ministerially: How they can assure and ensure the embracing and loving attitude of God by respecting the faith-based expectations of couples rather upholding faith norms and legalities! The organized faith communities as an institution are expected to follow the by-laws and constitutions of their own and by the States as well. Yet, we need to find ministerial interventions to transform the Societies as Societies ‘OF’ all and Societies ‘FOR’ all. Considering the rapid increase in the number of interfaith marriages (registered outside the faith systems) and the growth of interfaith families, it is a right time for the Indian Churches and faith communities to respond responsibly. This would also help all faith based communities to theologically, minsiterially and legally understand Marriage and Family. 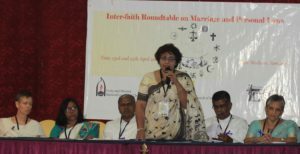 These were challenged the Church leaders to re-look the marriage and family minsiterially and decided to extend the pastoral care to the inter-faith couple with a question can Church officially allow inter-faith marriages. . When we have faith in God, why are we denied our privilege to get married inside the Churches / Holy Shrines? Will not God bless my spouse who belongs to another faith? If Church also closes its door for us, where will we go? Will the Pastor / Faith Leaders visit us and pray with us when we are discriminated and avoided by our parents and relatives? Will we get an opportunity to be part of the Eucharist table? Would God disown people who marry persons from other faiths? As a man or a woman, how would we discern gender-just roles and responsibilities? What are the legalities that are involved in such a context, upholding cultural, societal and religious heritage? If God is all-embracing, why does this discrimination prevail? Will our marriage be blessed and accepted even if we marry outside the Holy Shrine? If my faith system disowns my marriage, where will I practice my faith? It was indeed a great learning experience. The Ecumenical Movements, Ecclesial, Faiths and Theological Fraternity today cannot be silent on the theological and ecclesiastical questions raised by these interfaith couples and their family members. It is suggested that ecumenical movements like NCCI should come up with the theological and ministerial positions on Inter-faith marriages and inter-faith couples to facilitate the member churches to understand the theology of marriage and the theology of family in responsible contextual ways.